10%! Ten percent! Diez por ciento! (I think that’s the Spanish version) Jelly Bean, in the newest Android distribution numbers has hit the double digit mark. I don’t know why I’m acting like I’m excited about that fact, but it certainly seems like some sort of a milestone, doesn’t it? 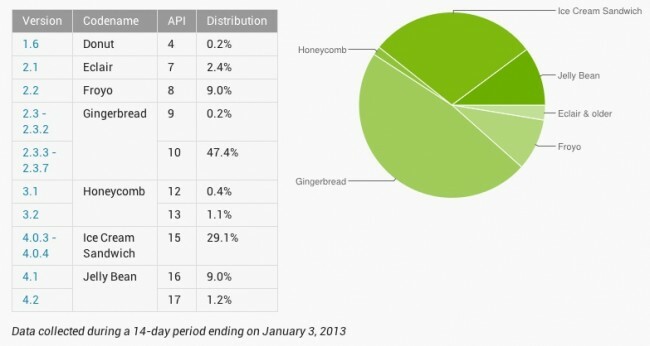 Also of note, we have Gingerbread dropping below the 50% mark for the first time in well over a year and Ice Cream Sandwich creeping up towards the 30% mark. That puts almost 40% of Android users on at least the top two versions of Android. Not bad? Not that good either. An ongoing battle.